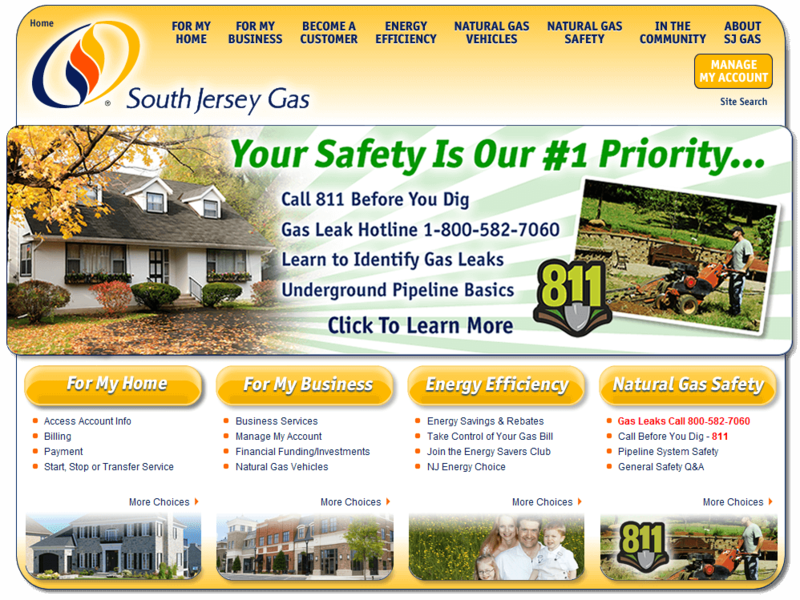 NJ Web Design Project: South Jersey Gas We’re very excited to announce the launch of the new South Jersey Gas website. South Jersey Gas is the provider of natural gas for one third of New Jersey, covering 112 municipalities and over 2,500 square miles. Their service area includes all of Atlantic, Cape May, Cumberland and Salem counties and parts of Burlington, Camden and Gloucester counties. South Jersey Gas came to Manna to redesign its website as part of an ongoing effort to continuously improve customer relations and communications. They wanted a clean, user-friendly layout focused on the end user. The navigation was a challenge as the site has well over 100 pages of content and forms. Considerable time was spent with the SJ Gas team to ensure the site was as easy as possible to use for all customers, not just those who are Internet savvy. The web design project included a Content Management System (CMS) which empowers the SJ Gas team to maintain the site themselves, only calling on Manna for major updates. The project also included a powerful employee intranet powered by WordPress.